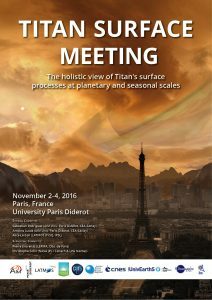 Each year, as part of the international Cassini-Huygens space mission, an international workshop is organized about the progress on the knowledge of the surface of Saturn’s largest satellite, Titan. 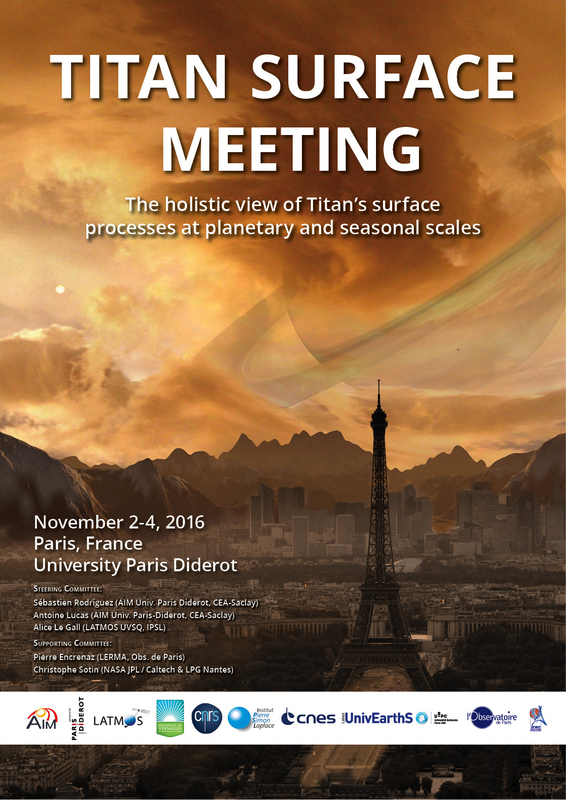 Sebastian Rodriguez and Antoine Lucas, member of Interface Group “From dust to planets“, received the support of UnivEarthS for organizing this meeting. This workshop will bring together around 70 researchers around the world (France, USA, Italy). Scientists will discuss the latest findings on the origin, geology and climatology of this moon so special like no other, in light of 12 years of painstaking observations. In collaboration with the French space agency (CNES), European (ESA) and the US (NASA), a round table on the future of satellite exploration missions will close the workshop. This event will take place on 2, 3 and 4 November 2016 in the building of the Hall of flour in the thesis room. The presentations will not be open to the public. See the event website for the complete program.